In amongst all the poster panic it would be easy to forget that Lost University is still part of the marketing campaign this year. The main page has been updated with a new Tutoring Center tab. Is the tutoring thing the online bit for people that don't have Blu Ray ? Rev Milo are you leaving. I'm confused. Really cool that Drew Millward stopped in. While I didn't 'try' for this poster, the intricate detail looks amazing, and no doubt even more so in person. Still own just Crash and Transmission. (which will probably be the only ones at this point). 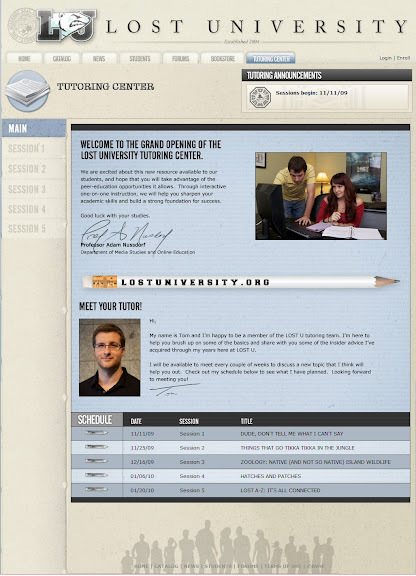 Zort, saw that new Tutoring Center tab pop up on the LU page when I was there last night. Sent out a tweet then, but I think that would have been 1 or 2 AM UK time. Our tutor's name is Tom -- there's a schedule for a new topic every 2 weeks. Some of those topics seem weird: "Dude, don't tell me what I can't say" and "Things that go Tikka Tikka in the Jungle"? Eek I haven't been back to school since I registered. This is like my dreams. Can't quite figure out what this Tutoring Center thing is yet -- the S5 Blu Ray DVD isn't released until 12.8.09, so I doubt they'd start showing us snippets DVD extras a month early. The comment about "interactive discussions" makes me think of an interactive chat on each of those dates, on those topics with this "Tom" as moderator. OK guys DCaaPB/RMA site is back up (to check your orders) -- I ended up having to tweet, but it was kind of shocking -- they answered in minutes! My wife just texted me and told me my Rousseau's Transmission came in! I can't wait to find out what # i got. In other news, Walt's Kidnapping has grown on me, I kinda wish i'd stuck around to try and snag one. Not too disappointed I missed out, but I like it a lot more than I did at 5AM EDT this morning! Hah! Lars, I wish I'd given it a shot, too. I went to bed 7 minutes before Buy now. Lars- me too! I'm not too disappointed either, but at 2am I decided to pass on it, and now I kind of wish I had ordered it. I'm kind of on the fence about this one. In some ways I really like it and I can appreciate the art in it. I like the Van Gogh similarities (I love Van Gogh). I just don't know if I want to hang it on my wall or if it's really my style. Oh well, it's all a mute point now! Now that I've caught up and am actually awake...here are my thoughts (in case anyone cares). I love how the print was done, it really is beautiful. But, I disagree with how Drew represented Mr. Friendly, it's just a really odd representation. But then, isn't he an odd guy? Also, about the Ebay listings...I'm going to say this loud and clear...stop talking about them! Don't you understand that that's how they get their money? They hope we keep posting their links and talking about them! Since we've made a commitment to stop, prices for these prints have gone WAY done. I know you're frustrated, but please, keep it to yourself. It's really getting old. Also, I hope a copy of this was given to M.C. Gainey. Haha, that guys is the man! Hey everyone! I¹m Tom, Professor Nussdorf¹s new T.A. 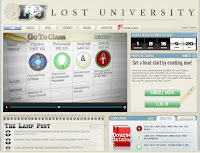 One of my job responsibilities (and perhaps my favorite one) is working at the LOST U Tutoring center here at lostuniversity.org. Once we get the program up and running, enrolled LOST U students can come to the center and brush up on a variety of LOST topics that will not only get you ready for when class begins on December 8th, but put you in the know for the final season of LOST. Our page will be up on October 28th and begin tutoring sessions on November 11th. I look forward to seeing you all there. You guys are great sports. My sincere condolences to those who missed out. I'm having an otherwise terrible day but it's always fun to check into this blog - an alternate reality if you will. I wonder the what the first order prize will be? Mr. Smiley's cap and fake beard? I think 1st buyer will get a comic, probably signed. It would be fun to have that beard though! ReverendMilo -- if you get that beard we want pics! 1st will get the Widmore board, no? Re: the issue of forgeries. Is there really any conclusive way to prove to somebody that the poster you have is a genuine purchase from Go Merch? Can't all of the emails/receipts/shipping labels, etc. be forged too? (They're not nearly as complicated as the actual prints). While an admirable effort, I don't think the registry list being maintained on Dark UFO really does the trick. Anyone can pose as someone else's username. For instance, if the registry says "I Love Lost" bought print 108 of the "Swan station", a forger could just make a forgery of print 108 and then tell a prospective purchaser "Hey, my username is 'I Love Lost', and take a look at my name on the registry. See, you can trust me." It seems like one good way to prove authenticity would be to have GoMerch or ABC publish a list of the actual, real-life names of the people who actually bought the original prints - but I'm guessing that would present a whole set of breach of privacy issues. @ Amy - that was the swag at the Glasgow FP. We don't know what prize 1st purchaser will get until they receive it correct? Wow. 11 sellouts of 200 prints. Raked in $110K. @Ginger, correct, but almost always, if there's swag, it goes to first purchaser as well. @AmyLynn - Would be cool if the board backed Hurley's spanish Green Lantern comic. @Amy - Ooooh, I didn't know that, cool. Is there a list somewhere that has all the prizes 1st purchasers have received? Just curious. and the fact that the ebay names are not the same as the profiles in darkUfo would make it hard to track. *feel the insanity- the prices didn't go down on ebay, they just added 2 more posters that are a cheaper price. were all getting old, but ... I'm gona vent ! Ok, done venting ! On the topic of forgeries. The prints are just that prints. Each color is silk screened on the poster one at a time where any forgeries probably just uses an ink printer to shoot all the colors, not giving it the same look as a screen print. With the quick sell out times, is it probably a fact that only previous buyers can complete the order with the pre-filled info on the pages? Even with my billing and mailing addresses pre-existing, I barely made it through in time. Thanks for the info. That's what I thought too, but I was under the impression from some of the comments that the technology is out there that allows accurate forgeries of even silk screened prints. If not, then that would seem to solve the problem. nihon5 - You can register first before buying, but you still have to log in and enter credit card details. It's a xcase of knowing which buttons to press in which order really. @Ginger - Lotto has been keeping a POSTER REGISTRY over at DarkUFO. First post lists all of our orders, below that is the prizes. @AmyLynn -- seems like the previous frame give away is the 1st buyer mini-prize. So this week probably the backer board. But I have been convinced sine the gave is the FP clue that there would be a comic involved, so either Hurley's Green Lantern/Flash or maybe the Mystery Tales comic of Richard's test for young Locke. I guess they could just throw in signed copy of the Watchmen since Damon is a mega-fan, but I think it'll be one of the 2 lost comics we've seen. And likely signed, too -- since the script was. If anyone is looking to depart with Frame 11, I will be looking to buy for the sale price listed! I missed out because my internet didn't let me login. Help me out! I'm proud to say I bought one of Dan Millward's prints with this purchase...he seems like a stand-up guy and a helluva an artist. I think it's awesome that he took the time to talk to us, great guy. Also, did we ever figure out why they took down The Love Triangle at the time of the reveal? And, on that note, weren't there like 90 copies of that left as of this time yesterday? How did they sell so fast?!? @ reAnimated - Thanks for the link! jesse why would you buy a print before you see a possible print? what if it's an odd size? also what kind of scene are you hoping for? You know in the past Ive complained about the odd size posters, when I realized today that I have a frickin mat cutter and alot of leftover mat board from college. D'OH! Couldve just gotten a larger fram and matted them. Oh well. Knowledge for the future. OK, I'm ready for the next clue. @anon- yea I got a little carried away but I thought they would all be 18X24. I can always return it but I'm trying to stay positive lol. Okay I'm posing this question here because you people are the only one's who will understand this. I'm going on vacation next week. I leave Wed morning get back Monday night. While I'm staying with friends, and I fully expect that I can use their computer, should i bring my own, so I can stay on top of this thing like I normally do? I have a feeling me getting another poster is slim, (especially if the reveal is while I'm in the air) but I have to try/see. I've only missed Hurley's reveal and was late to Locke's which still haunts me as that's my favorite poster. What to do fellow Lost poster fanatics? Also is it odd to call my friends in advance to see what their internet speed is? (I feel that it is). I agree that I like this poster more than I did at 3 this morning. But I still don't think I'd have tried for it. (I use try as buying doesn't guarantee). And I think I made this sufficiently long enough to have made everyone fall asleep. Which was my goal. Wanted everyone to get a chance to make up some of that time we all lost this morning. @mesocrazy- I would definitely bring my own laptop so you can make sure you are on top of things. what happens if someones using the computer when you need to check up on things or worse then the print goes on sale!? Also, calling and asking what their internet speed is kind of weird but if you are good friends with them I'm sure they would understand. I too used to cut and matte my own work. I have been thinking about getting my own matte cutter again (but it has been 15 years since id cut) since I like fancy matte work and I will have quite a few things to matte again now. did you catch the crazy matte work I paid to get done on my butcher? I do plany to be adding my standard print plaque plate as seen in the picture above. I would not rely on any other machine if I could bring my own. Form fields could be cached (on your machine which is handy) and their machine may have some strange TSR or other software that ends up slowing you down. Take your's and then do a speed check between the two when you get there. reAnimated- did you see my link to where i bought my jumpsuit? It might have gotten lost on the previous post's comment page... on the very bottom. Me So Crazy. Take yours. And make sure everything is working before the reveal. I had to travel during the Crash reveal. I almost had a heart attack trying to buy it. But I got it. SAWYER: Well, gee, I didn't have time to ask that, with Frogurt behind the firewall and all. JULIET: They attacked us on their forum. LOCKE: [Pulling up Ebay and various art forums] These guys have fast fingers. SAWYER: Who cares about their fingers? Where the hell you been? LOCKE: If you've been going through what I have, James, maybe the more appropriate question would be, when the hell have I been? SAWYER: What happened to your chat? JULIET: We can swap stories later. We told the rest of our group that we would meet them on the other server. If there's any chance of reconnecting with them, we'd better get moving. SAWYER: Fine, seeing as we have no password protection to make sure these guys don't try to infiltrate our chat again. Guess we're gonna have to shoot 'em. CUNNINGHAM: [To Jones, whispering] Quis est nomen of site they ire ut? SAWYER: [Hitting Jones on the back] What? JULIET: Operor vos amo picture? JULIET: They're speaking Latin. That one asked what the URL was, and the other one gave it to him. JULIET: The same reason I do. Because they're Others. @ Amy - LOL, I love reading these. Keep up the good work! @Amy Lynn I am literally laughing out loud. Funny funny. Thanks Jesse T, Rev Milo, and Eugene. I knew this was the place. No one else would understand. I will do just that. Hopefully I won't miss the reveal. (It's a two hour flight and I can just see it happening while I'm on the plane). Everyone here is so delightful. I may just post more long sleep worthy posts more often. I'm just kidding for those that immediately yelled out "NO". I do my best work as a lurker. :) Seriously though I want to marry this place even if no state would recognize it. And I think I speak for everyone when I say, I"m ready for the next clue. Too soon? Um I really was kidding. Why did I post twice and oh my goodness why can't I delete delete. This is not how I want to make an impression. Also random...Entertainment Earth has Daniel Farady and Dr. Edgar Halliwax Bobbleheads - preorder for Dec. release. What random characters for bobbleheads. No Jack or Locke? ONLY 200 WERE SOLD TO THE PUBLIC OUT OF THE EDITION OF 300. Note the part about the print# not appearing in the poster this guy is going to send you and the part about the printed signature -- These prints are HAND PULLED. Be careful on EBay guys. Can anyone who has a Smokey poster tell me if any of the above are the case? Otherwise I am going to email Ken Taylor and GoMerch. Parts 5 and 6 of MOTU got leaked on DarkUFO. I have Smokey and it has a number and Taylor's signature. That Ebay seller is full of you know what. Thanks -- Just confirming before I email the artist and GoMerch! It is possible that the seller means that the black squiggly line covering the number wont be on the poster. #210/300 for Transmission! It looks more green than on the site. I like it! Hey all -- just got an email reply from Drew -- it really was him here today, and he's very gracious! Hi all, with the exception of chat room posted order #s, and new e-bay information, THE LIST has been scrubbed and updated. Error count was HIGH, so hopefully back on track. If you received merch at reveal or via Lost friend and want your handle listed, reply over at DarkUFO Arg "The Official . . ." you know that place. Tyson, if you read this, I beg you to do something about the ginormous pic and the overall size of the HUB. Thank you. And since is post is about MOTU (ha ha), I really liked this episode. the UPDATE with new MOTU logo spliced in a the end maybe points to reconstituted Dharma Initiative. ObFuSc8 the question of Mr. Taylor's signature did come up shortly after reveal. So, if you think he will answer, ask. No harm. And really, who would buy an original print with no number? Well Jesse -- this seems a weird way to word that -- I guess I'll just ask Ken Taylor if he actually signed his prints or had his signature printed on there. Even though I don't care for the latest poster, that Drew guy seems very cool! :) How great that he took the time to check in. I have Smoke Monster, too. And like the other prints it has written number in pencil, but I will say, and didn't notice this until now, that his signature does look printed instead of handwritten. It's not written in pencil like Eric Tan's or Olly Moss'. LT, I hope you are just grabbing the print numbers off of my site for the list. I'll pray for a smaller pic too. people ken taylor did NOT get to sign these print. it is PRINTED with the layer of black ink. the shipping cost and time just doesn't make sense considering he lives downunder. As usual I don't understand. What was spoiled/leaked Nachosaur? The Taylor one says signed, the rest say hand signed. Don't need to ask anyone, it's right there. Pretty common in the gig poster world for artists who live out of the country. Good news is...Drew's says hand-signed! He does not have that happen much. It's a quiet night in ARGland tonight. Guess everybody's catching up on their ZZZZZ's. Zort, you should see if Drew Millward would do an interview for the site. I don't want to bother the guy and I don't know if he's allowed to talk about it, but he seems pretty friendly and outgoing. It'd be pretty interesting to hear about the process he went through, whether he got to chose the scene or was assigned, etc. Not a bad idea for the rest of the artists either -- Eric Tan seems fun! Apologies all about my previous post about the Ebay seller with the blocked out # and printed signature. I looked back at the DCaaPB and I guess it never says hand signed. And I certainly could have misunderstood the bit about the print#. First, Zort - thank you for feeding my LOST addiction but my wife has a different opinion. Happy to see that many of you got the print today. Been a tough day for me - it's the first one I tried for and didn't get. Really like it too - bummer. I wasn't on top of my game this morning and trying to type in the dark in order to not wake up all my kids. I'll just keep my eye out down the line for this one. Yes, I do believe you misinterpreted - althoguh I will say the sellers wording is ambiguous, so understandable that you did. He means that the obscuring of the print # will not appear on the print. If I can offer my two cents, having collected silkscreened prints for a while now, this is actually common with sellers as a *small * security measure - the obscuring of the exact # on the print. It actually prevents bootleggers from tracking print #'s, knowing which # they can get away with duplicating or not. This thing going on with the LOST series where people are offering their print #'s for the record is unusual in that respect. Usually this is kept in confidence - I say that loosely and not trying to stir up worry, because honestly, - it's not that great a concern. which leads me to my next point.. I only hope to clear up anything that people might not be aware of, as I understand this is the first exposure of many of you to the art (and commerce) behind screenprinting. Sorry if this got long. SO very sorry about my typos. I write, but I am not a typist by nature. midday is a straight up KNOWER! i hope he does come in for an interview~!! i love his poster. that was so nice of him to leave those comments, i had no idea he read them..
most if not all of the artists would be down with doing inteviews with you guys. hit'em up. Just got back online after leaving the office & have finally caught up with all of today’s posts… Wow! A visit from Drew Millward, Milo's training a Cadre,classes at LU, more fun from Amy Lynn and talk of counterfeits. That's quite the range of posts. @ Mel (if you’re out there) - Your postings from earlier today made me think what this ARG experience and more importantly what LOSTARGS has meant to me over the last few months. I’ve never been one for chat rooms, but something about the people that are part of this community and their devotion to helping one another out, as well as the tireless efforts of Zort inspired me to participate & I'm damn glad that I have because it's been a blast. In most parts of the world on 12/25, a jolly, white bearded man, dressed in red, visits children & leaves behind their hearts desire. Sometimes this fine fellow can't grant every child's wish for one reason or another. That's why he enlists the aid of elves to help spread cheer and goodwill. Maybe it's a little early, but I'd like to play elf tonight. So far, I've been fortunate enough to buy 8 of the 11 revealed posters (we’ll see what happens with remaining). Hurley's Numbers will be used as part of a Lost themed auction item that I’m putting together for a children's charity. Yes, it will hopefully sell for more than the $61.10 that I paid for it, but it’s for a charity, so I hope those on these boards will not judge me for doing this. The rest will either go up in my office or up at home with the exception of Walt’s Kidnapping. wow, wow that is so cool. i love you guys, this is why this site is amazing~!!!! I have no words that can even hint at the ways the people in this community amaze me. I cant think of how many times I have been shocked by this community over the time. any now add one more to the uncountable list. MiddayShadows -- as I said, apologies to the seller, ARGers and the community. Thanks for the info. I was sent the link and saw the wording about print# and it just seemed suspicious. That and the posting with an $800 BUY IT NOW price got me going. I realize of course that a print like The Smoke Monster would be close to impossible to duplicate. But unscrupulous seller could put a photograph of the actual poster on their auction and send you a fake. You'd figure it out when you get the print, but by them it could be too late. Lots of typos, whoa. Sorry. Still intelligible, I hope. @ JPL - What a wonderfully generous offer. It is people like you that make this community so great & fun to be a part of. Thank you for ending my day on such a high note. JPL: Awesome (and sweet) offer! And I hope the charity auction goes well for you, too! This just proves what a great group of dedicated LOST fans we all are! I think I'm going to cry. REF Smokey print. I asked Ken Taylor and it is NOT actually signed by him personally. Just stamped. Hi all. One more shift for work then a few days off! Caught up on all the comments on my phone at work today - man theres a lot from the last 24hrs! After seeing the poster last night, I thought it was very good, but after asking myself if it was a style I would hang on my wall, I had to unfortunately answer no. Wonderful to see Drews comments here - what a stand up guy! @ObFuSc8 - caught your comment re me and my trusty dialup! haha, nice to know someone out there feels my pain! lol ;) Didnt need it last night however! Roll on next week. Oh yeah - Rev, I do hope you got #1! @JPL your offer is so beyond cool. (yes 'cool'). It's these kinds of things that make this place more than just a place to find the newest poster. People are beyond kind and generous. @kiwilostie, nope. There sure isn't. Crazy how far we've gone. In some ways I look forward to the end so I can go back to regular internet practices. (re: not checking it every other half hour and then come reveal time being a mad woman and refreshing the page like my life depends on it) & at the same time, I've loved all of this craziness. And I'll miss it when there is no longer a poster to reveal. (I'll have to make my own perhaps. But then I'll know. Yeah, it won't be as fun. But the stress level will be gone. Yeah still). JPL..Your offer is very gracious and gives me hope and reason to stick this ARG out. As posted elsewhere, the one who brings sleep has made the same gracious offer and I have already accepted his. You,,and all the Lost Fans involved in this ARG,,and involved with this Show over the years..are INCREDIBLE! The Show has been very special to me and now I know why. Its being connected to all of you that is so very " Magnificent". I thank you very much JPL for the offer and some day, some how, I hope to return the sentiment. Folks like yourself,,anybody who can quote Le Guin,,and the many others, here and on other boards, again make all of this really worthwhile. Best of Luck and Fortune with your Charity Auction. I hope there are Lost Fans and Art Print Fans in attendance and they all have fat check books.